I love it when a meal comes together like this one did! 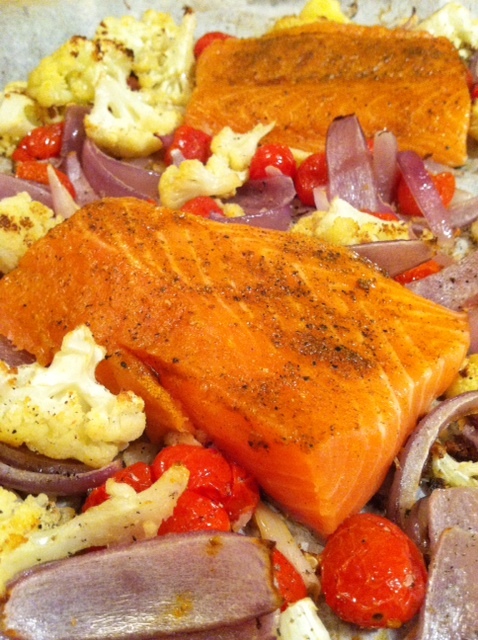 I have mentioned before that one of my favorite ways to make Salmon is by roasting it. It just seems to come out so perfectly every time. This recipe was one of my favorites that I have had in some time. The complexity of flavors in such an easy dish are sure to impress. It was ready in no time for a quick week night meal and is fancy and colorful enough for company. 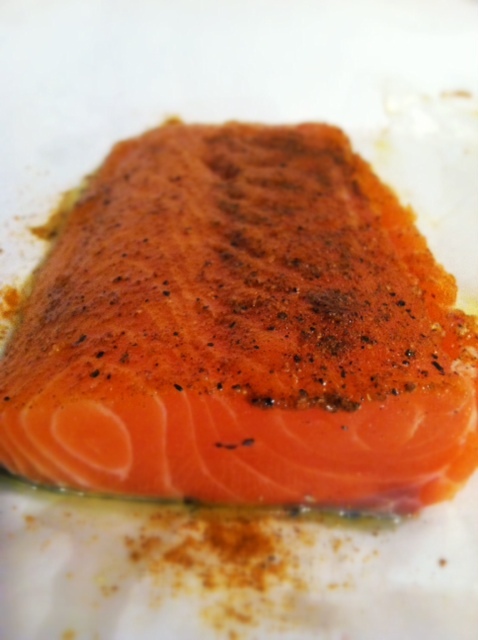 The salmon is perfectly flavored and seasoned with a small amount of curry. 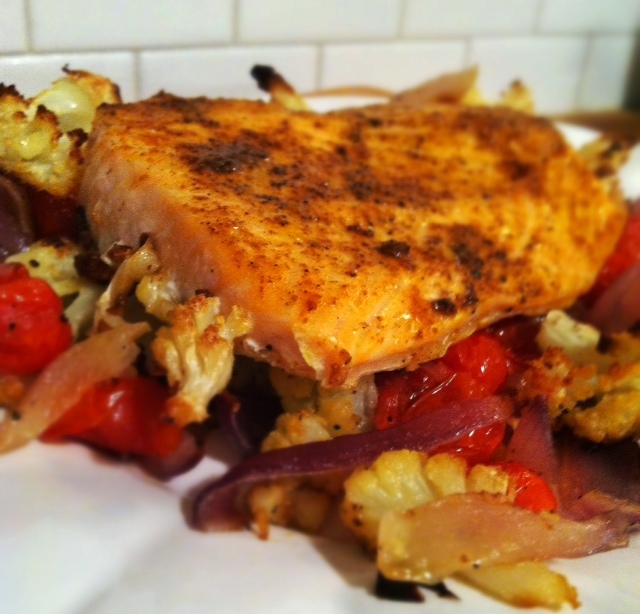 The tomatoes are sweet and juicy and really pair well with the substantial cauliflower and the caramelized red onion. I have already considered making this combination of vegetables again in the very near future. The textures are really great together and it was so pretty that I had a hard time choosing which pictures to post! The heat is going to help with flavor and timing. Combine the vegetables with olive oil and sprinkle with salt and pepper. Line them on a sheet pan and roast. 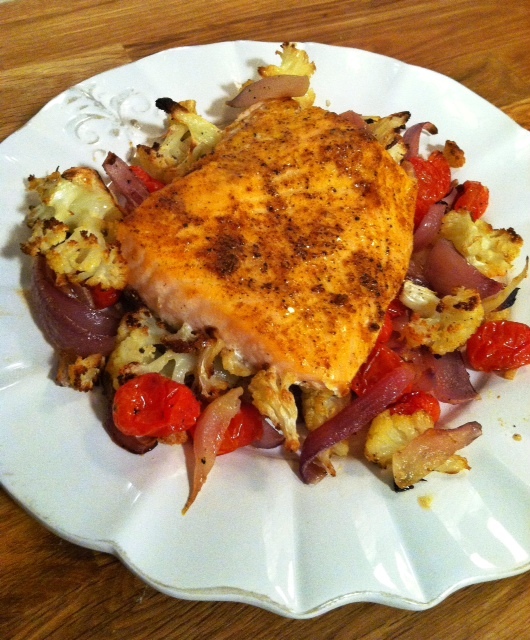 Nesltle the salmon into the partially roasted vegetables and roast a little longer. And it is good for you! 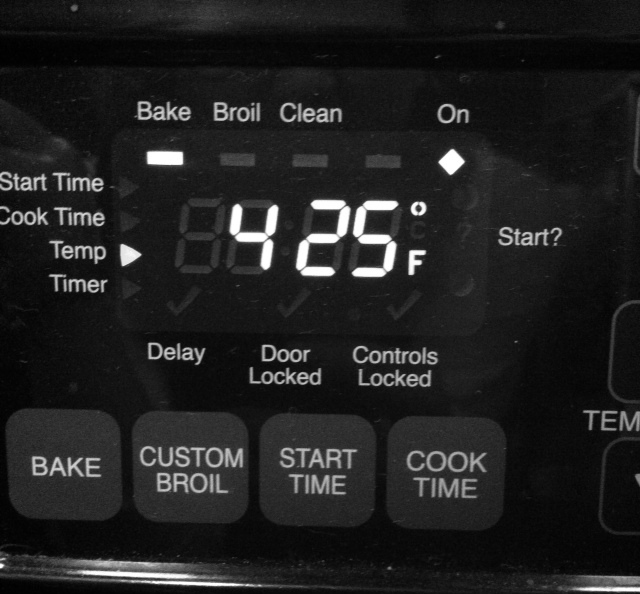 Heat oven to 425 degrees. 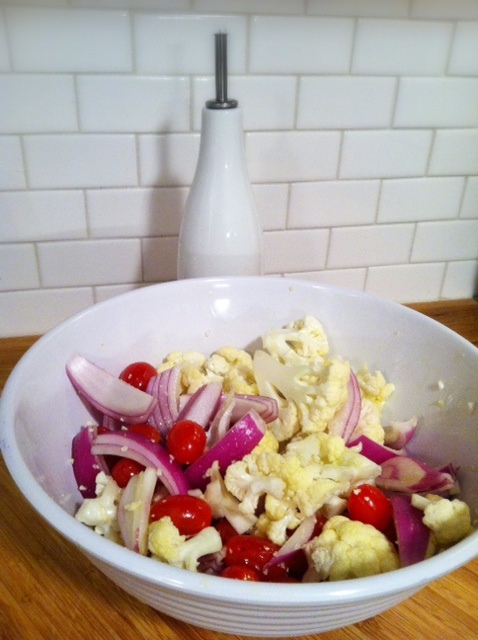 In a large bowl, combine, cauliflower, tomatoes and onion with the olive oil. Season with salt and pepper. Roast on a large parchment lined baking sheet for 20 minutes. 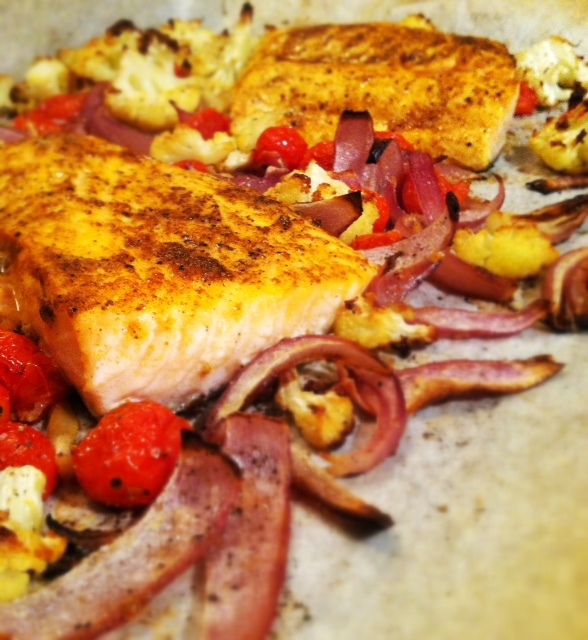 Drizzle salmon with olive oil and season with the curry. Sprinkle with salt and pepper . 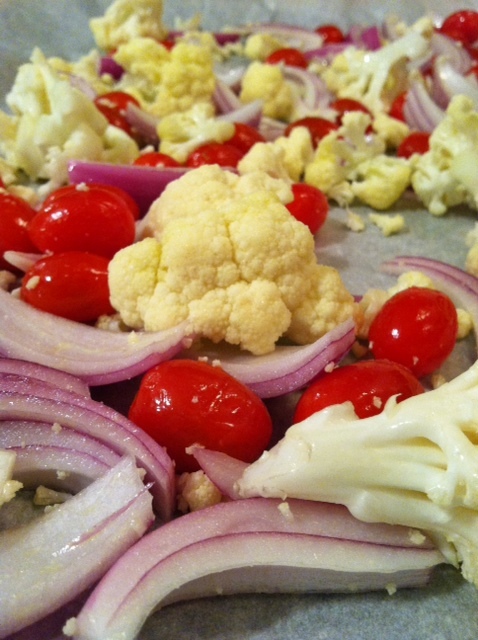 Nestle it among the vegetables on the baking sheet. Continue roasting until the salmon is opaque throughout and the vegetables are golden brown and tender, 12 to 15 minutes more.